At El Dorado Maroma, A Beachfront Resort, by Karisma, guests encounter a Gourmet Inclusive® experience that fosters togetherness. 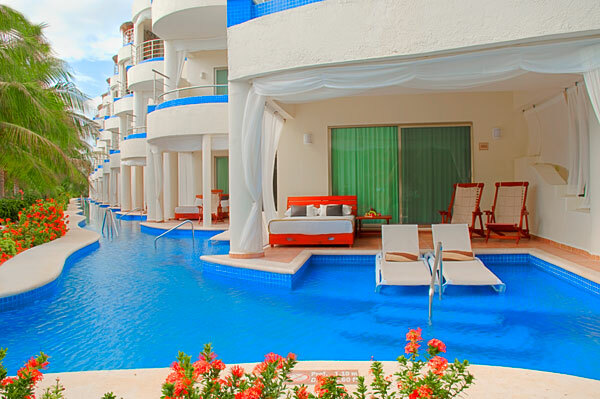 The resort is located on the renowned Maroma Beach, which is considered to be one of the top ten beaches in the world by independent reviewers, including Travel Discovery Channel. The resort is ideal for adults, ages 16 or older, seeking active relaxation in an intimate 101 room resort setting with private infinity pool suites, swim-up suites, honeymoon suites, lavish spa and full concierge services. All suites and facilities at this beachfront property offer beautiful views of our lush tropical gardens or the stunning white sand and clear waters of the Magical Maroma Beach at El Dorado Maroma were designed in a luxurious and contemporary Caribbean décor and are equipped with air conditioning, ceiling fans, king size and double beds, satellite TV, DVD/CD player, telephone, shower, hair dryer, make-up mirror, ironing board & iron, radio/alarm clock, safety deposit box, mini bar with beer, water, soft drinks and juices refilled daily, coffee/tea maker and a comfortable oversized terrace with an outdoor bed where you can listen to the Maroma lullaby. The á la carte restaurants and bars at El Dorado Maroma combine a selection of the finest & refreshing cuisine and drinks in an extraordinary setting overlooking the celebrated Maroma Beach. One of the most popular activities in the area is deep sea fishing; your catch of the day can be prepared in a variety of ways by our staff. PAPITOS GOURMET BEACH CLUB – Features an interactive culinary experience in an open kitchen concept, offering a themed lunch menu throughout the week: The Chef Brochettes, Boutique Burger, Taco Bar, Fish Market, BBQ, Spanish Paella and The Prime Rib; while enjoying a breath-taking Ocean view. SABORES – New Mexican Caribbean Cuisine Sabores restaurant serves exceptional breakfasts that will keep you energized for an adventurous day. Irresistible Mexican & Caribbean specialties with international flair are served as well as the most exclusive fresh seafood dishes caught daily for the traveling epicurean. Our Chef uses the latest culinary techniques to make every bite an unforgettable experience. Guests can enjoy air conditioning dining or outdoors at Sabores Palapa with the fresh Caribbean breeze. KIYOKO – Oriental Restaurant Kiyoko restaurant is a mystical combination of heaven and ocean. In this tasteful setting you will experience Asian-inspired cuisine served in the most creative ways. Sushi, Sashimi, and Teppanyaki are only some of the delicious mouthwatering dishes found on our menu. 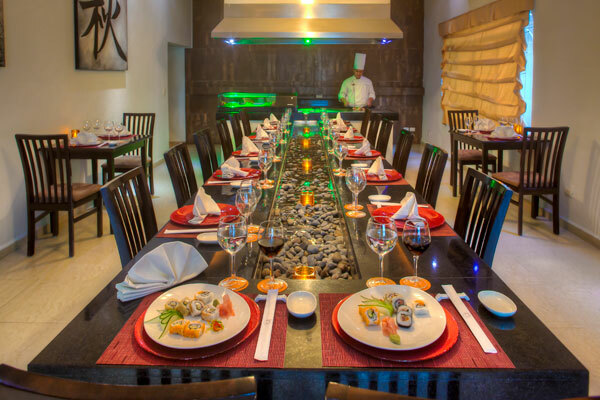 Kiyoko provides its guests with a very intimate dining atmosphere as well as chef interaction. MIO CUCCINA ITALIANA – Italian Cuisine Providing intimate Italian dining using a traditional approach, Mio features creative cuisine from Italy’s sunny coastal and island areas. Enjoy a variety of Ocean Fresh Fish Carpaccio, Fruti di Mare and exquisite pasta among other succulent dishes with authentic ingredients in a relaxing and romantic atmosphere. BAR “24” SWIM -UP BAR – Located next to the Mi Hotelito Beachfront section, this ocean-front bar serves Mexican beers, an exciting variety of tropical drinks, cheladas prepared to taste and healthy energizing drinks in a laid back Caribbean atmosphere. SABORES & TERRACE SWIM-UP BAR – Sea front bar with an exciting variety of tropical drinks, Mexican beers, healthy energizing drinks and cheladas prepared to taste in a relaxing atmosphere. Accommodations as selected with nightly turn down service. Welcome glass of sparkling wine. All gourmet meals and specialty bites. Unlimited alcoholic and non-alcoholic beverages from a selection of domestic and international premium brands. 24 hour room service (Restrictions apply on rainy days). Use of in room safety deposit box. Two fresh water swimming pools (includes a relax pool). Non-motorized water sports: kayak and snorkeling gear. Spanish lessons, yoga, aqua aerobics, latin dance lessons, cooking classes and more. Special nightly entertainment includes karaoke, live music, comedy show and more. Shopping tours to Playa del Carmen (limited seats). Scuba diving trips, certificates, rental equipment and deep-sea fishing. 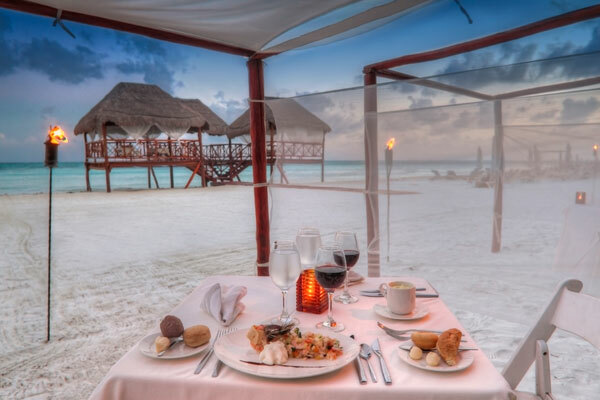 Romantic or family dinner on the beach. Telephone service, Internet services, Fax services. Massages: Relaxing and Anti-stress, Swedish, Sports and Reflexology. Offering a Beachfront Sky Massage in our unique over the water Ocean Palapa. Facials: Deep cleansing, Moisturizing, Nourishing, Revitalizing and Oxygenating. Special body treatments: Exfoliating body scrub, Milk bath, Thermal mud massage, Royal deluxe. Beauty salon: Make-up, Manicure, Pedicure, Hairstyle and Haircuts.